Developers of world-famous properties like The Venetian, The Palazzo and Marina Bay Sands are now opening a French-themed resort in Macao named The Parisian Macao. 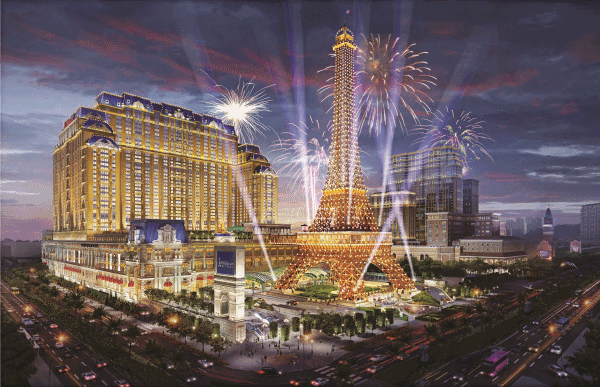 Sands China, the majority held subsidiary of the globally renowned integrated resort developer Las Vegas Sands Corp., will be opening a new French themed resort called The Parisian Macao on 13th September, 2016. Las Vegas Sands Corp. is known all over the world for their exclusive properties, which includes The Venetian and The Palazzo on the Las Vegas Strip, and the picturesque Marina Bay Sands in Singapore. Sands China Ltd manages their assets in the Asian market and The Parisian Macao will be the latest addition to their reputable portfolio of properties on the Cotai Strip. It brings Sands China’s total Macao investment to more than US $13 billion (MOP 104 billion) to date. The City of Light, Paris, forms the heart of The Parisian Macao with the new resort featuring a half scale original recreation of the Eiffel Tower. The property offers a full range of facilities that includes 3,000 guestrooms and suites for accommodation, Convention and gathering space, international cuisine serving restaurants, spa, kids’ club, health club, pool deck with themed water park, and a 1,200-seat theatre. The Parisian Macao will also include a retail mall named Shoppes, which will offer premium products and luxury clothing brands carrying the latest trends in fashion and couture. A vibrant mix of street artists and entertainers will also liven up the setting with an authentic recreation of the streets of Paris within this mall. The new resort is set to become an integral part of the Cotai Strip skyline, following the lead and original vision of Sheldon G. Adelson, Chairman and CEO of Las Vegas Sands and Sands China Ltd. “Our goal to create a large-scale leisure and business destination in Macao, which started with the opening of The Venetian Macao nearly 10 years ago, will be fully realized when The Parisian opens its doors in a matter of weeks,” Adelson had said. For more information on The Parisian Macao, visit parisianmacao.com. If you’d like to check or book flight tickets to Macao, click here to fly with Qatar Airways. Tagged Experiences, LifeSpice, Luxurious lifestyles, Luxury hotels, The Good Life. Bookmark the permalink.